The U.S. kosher market has become an unheralded boom for food manufacturers. Today, consumers are concerned about more than just the kosher status of their food. Over 12 million American consumers choose Kosher food products for reasons related to health, food safety, taste, vegetarianism, lactose intolerance, and other dietary restrictions. Generating over $12 billion in annual sales, the kosher food industry has become big business. Certifying over 800,000 products produced in more than 9,000 plants located in 100 countries around the world, OU Kosher is the clear leader in the kosher food industry. As the world’s largest, most respected kosher certification agency, the OU certifies close to 70% of the kosher food sold worldwide. Increased industrialization of food production has boosted demand for kosher certification. Foods are increasingly produced using complex processing techniques and multiple additives, all of which require kosher certification services. The OU is at the forefront of this worldwide industrialization with Rabbis who have specialized expertise in all areas of food production. 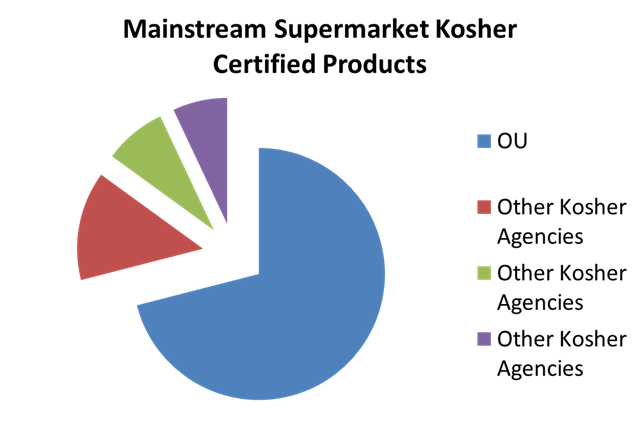 Of well over 200,000 packaged food products on U.S. supermarket shelves, the OU kosher symbol is found on close to 70% of all products combined. OU certified companies know that having the OU symbol on their products immediately and universally enhances their marketability. That’s why they choose the OU.